Games and a GTX 970 - My Impressions. Also, The Crew is on sale. A while back, I asked Oppo for advice on how GTA V would run on my rig once I installed my GTX 970 (a Gigabyte G1). I’ve been playing that and a couple of other Steam games, like Car Mechanic Simulator 2015, and here are my impressions. The G1 itself has three fans for its Windforce cooling system, and it’s huge - I had to rearrange some bits and remove a bracket to make room for it. My rig runs much more quietly in normal use (i.e. internet browsing) now, which I figure is probably because Intel’s integrated graphics were running the show before. The blue LED lighting looks cool in the Cooler Master case. I installed MSi’s Afterburner software (rather than the OC Guru II software that Gigabyte included on a disc) so that I could monitor the temperature, FPS and so on per Lekker’s advice. It looks kickass, though I haven’t bothered with overclocking at this point - I just enabled the in-game stat display. As far as GTA V goes, the graphics settings as I have them configured (~3 GB of VRAM, so there’s a little space between that and the 3.5 GB threshold) are a lot better than what’s on the PS3 version. The foliage is much more detailed, and the rain looks much better with that ripple effect. While I wanted the game to run at 1080p/60 FPS all the time, I don’t really mind the 45-60 FPS range that it usually runs at. It does dip to 25-30 FPS at times (usually when I’m driving around at night and/or in the grass- and plant-dense hills), and I’ve also encountered color splotches every now and again. I’ve noticed that the framerate dips happen somewhat more often since the Ill-Gotten Gains Part 2 update, and the built-in benchmark test runs at a lower FPS as well. I’ll admit that confirmation bias could be a factor here, since I didn’t connect those dots until I read Kotaku’s piece on it. The audio is clearer since I’m playing it through headphones instead of my TV. I absolutely love how much quicker everything loads - loading times for the PS3 were looonnnggg, while I rarely see the loading screen blurbs on the PC version. Connecting to GTA Online happens much more quickly as well, though I’ve spent almost all of my time in Solo Sessions LOL. Hooray for solid-state drives! 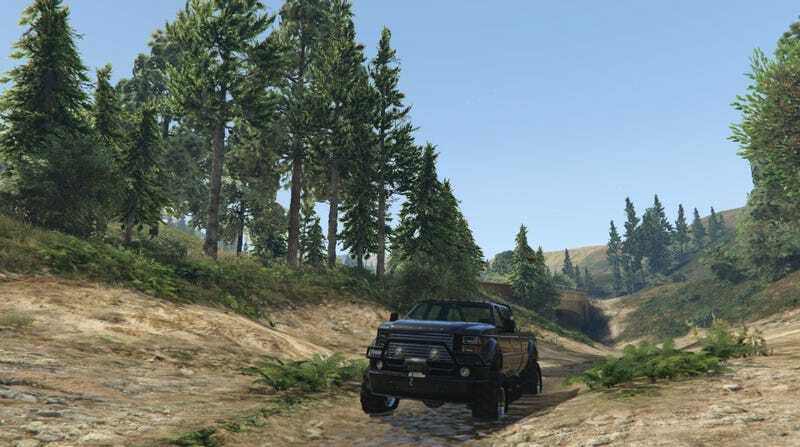 There’s a lot more variety in single-player Los Santos since it mixes in all of the vehicles that were added in updates; I also like the pre-customized vehicles that I’ve found (like the teal Pfister Comet near Franklin’s Whispymound Drive safehouse, or a red/bronze Grotti Turismo R that was out-and-about), though I haven’t found any of the ones that you can get in GTA Online. Keyboard-and-mouse gaming is new to me, and I quite liked the feel of aiming and firing with the mouse. I got frustrated with it after a while, though - my mouse, a Logi Logitech MX Anywhere, doesn’t really do well with long-presses, and letting up the pressure even slightly screws with my attempts at aiming. I also didn’t like having to rely on the right number pad of my keyboard for certain maneuvers (i.e. flying), and moving the mouse around to reorient the camera. I ended up getting the new 3.5mm Xbone controller (though I don’t have what I’d consider to be a sufficient headset for it, LOL) to have all of the controls close together again. The controller feels rather bulky, but the knurled thumbsticks feel great. Too bad the rumble motors in the triggers don’t seem to work with GTA V.
Anyhow, I also bought Car Mechanic Simulator 2015. It’s an interesting (and surprisingly small at ~2.2 GB) game - you take jobs, order and install needed parts, and can apparently buy cars of your own to spruce up and resell. I’ve only fixed up cars in the few hours that I’ve played it; you have to discover some features on your own (like changing the oil or taking cars out to the test track). I liked a few of the tracks from the in-game radio, but they got repetitive very quickly. It does run well with all the graphics settings maxed out, though. XP earned from completing jobs comes pretty slowly depending on your familiarity with the game and skills you’ve unlocked, so I might keep this game on the back-burner in favor of others for now. If you were considering buying The Crew on Steam, the regular and Gold editions are both 50% off until 1 P.M. EST tomorrow, which is what they were going for during the Steam Summer Sale last month. I’ve heard that the engine sounds and graphics are lackluster, but the incoming Wild Run expansion is supposed to bring a graphics overhaul. I’ve downloaded the demo and will play around with it for a bit, but I do want to buy the full game - it’s been a while since I’ve played an arcade racer with customization in it. Anyhoo, if you guys want to add me on R* Social Club or Steam, I’m SonorousSpeedJoe in both places.